Although food sanitation laws are, of course, developed with safety in mind, putting them into practice often culminates in piles and piles of discarded meat. 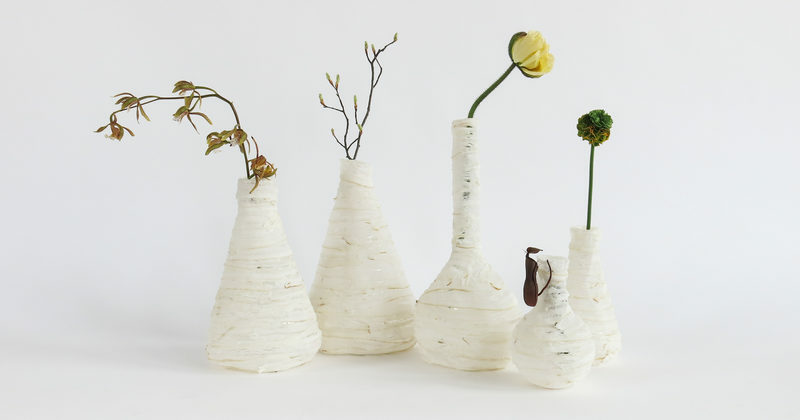 By decellularizing discarded meat from local supermarkets, he creates a stunning medium with which he produces vases and light fixtures that are so refined and delicate, they belie their building blocks upon first glance. Decellularization is a process used in labs that focus on tissue regeneration research. When raw meat is put through this process, it loses all cellular content. The end result is a collection of malleable white strips that almost mimic the appearance of marble when they dry down. And the series is atypical on all accounts, not just in regard to material and production. The inspiration behind his designs is actually Escherichia coli, which is the bacteria that drives protein products off of grocery store shelves. By reimagining discarded materials, artists like Isaac Monté encourage us to reimagine the ways in which we use these products before our only option is to throw them away. To learn more about this artist’s life, work, and studio, be sure to check out Atelier Monté’s website.